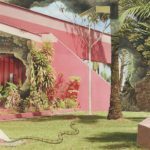 Bubble gum pop so pink and shiny you’ll need to wear sunglasses similar to those sported in the video for “Eye on You,” a Hitchcockian thriller from California’s Sugar Candy Mountain. Taken from the band’s latest LP, 666, you can watch the video for “Eye on You” below and purchase 666 on pink vinyl from PIAPTK Records (US) and pink cassette from Super Fan 99 Records (EU). Sugar Candy Mountain 'Eye on You' from Super Fan TV on Vimeo.